At the eleventh hour (well, almost), I finished this dress so that I could enter it into the fun Compagnie M sewing competition. Marte has organised some great sponsors and prizes for people who would like to create a garment by creatively using one or more of her great patterns. 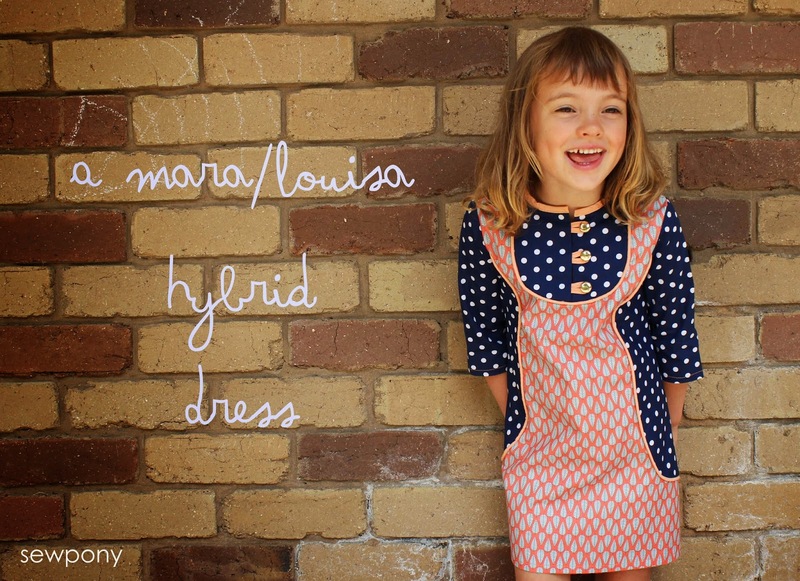 I morphed the Mara and Louisa patterns to create this colourful dress. The bib detail is care of the Mara pattern. I incorporated the curved back panels of the Louisa dress and also included the panels on the front of the dress. I had some trouble printing the Louisa pattern (I was using a printer I don't usually use). I therefore had to guess the dress length which is why it is a little short. I covered some white cord with apricot bias binding for my piping. The blue spotted fabric is a Robert Kaufman print that I received from Rachel as part of Marte and Marta's Mailbox surprise series. The orange and teale leaf print was from Spotlight - although I have forgotten the name. 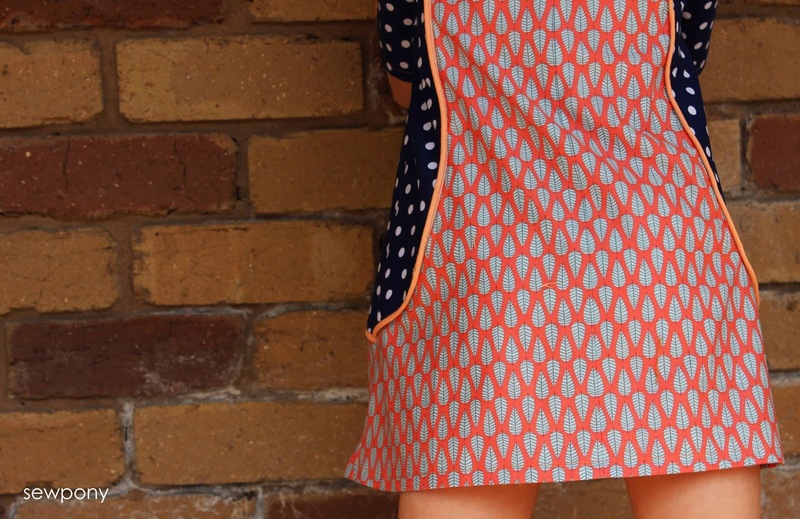 If you would like to 'vote' for my dress, head over to Compagnie M and 'like' it. I could win a cool prize! Thank you and thank you Marte! Hi Suz, it is such a fun and bold mix of patterns and fabrics :)Love it! I love it! You've got my vote! super adorable!!! !I love the style! Very fun mix! I wouldn't have thought to merge these two, worked nicely. Great fusion of two wonderful patterns, Suz! I love the design but I think the fabric combination is absolutely fabulous! 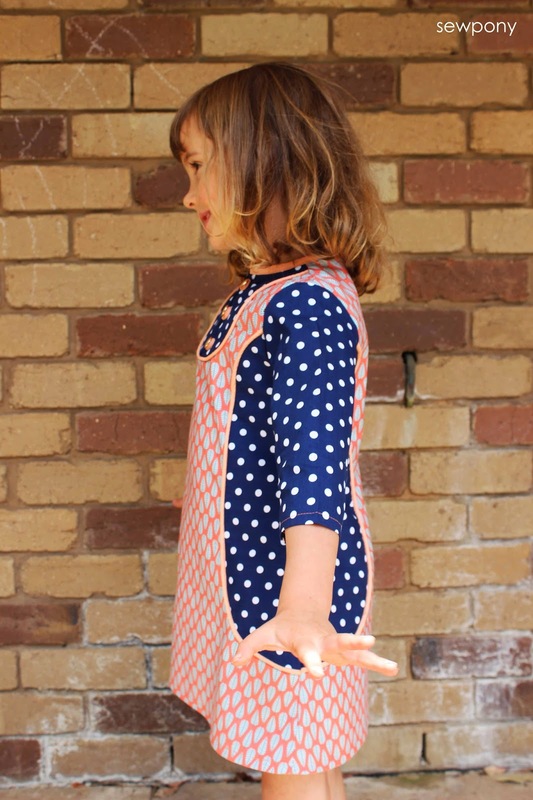 Super cute results of pattern and fabric mixing! the dress is cool. How super clever are you!!! Ooooooh my gosh Suz....I am obsessed with this dress!!! The fabric combination is AMAZING!! Love love love! wow, i can't believe i missed this! i saw the post before and after this one, but somehow missed this. such a sweet dress! and sweet photos, too!